Today I used my 'wild card' and skipped the Digital Immersion day - to join my class on a trip! 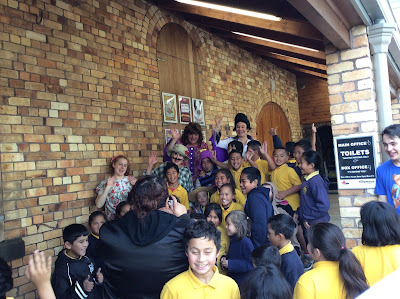 We went to the Pumphouse Theatre in Takapuna to watch the stage show of Badjelly the Witch (based on the book by Spike Milligan). 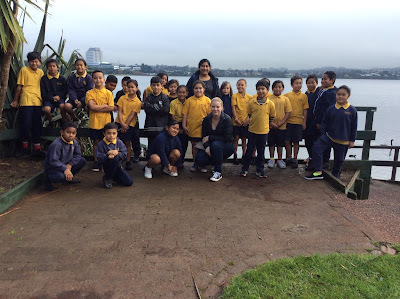 We chose this trip as our inquiry unit was 'Reading for pleasure, writing for leisure'. My wonderful class walking down to the theatre. TPS filling up the theatre. 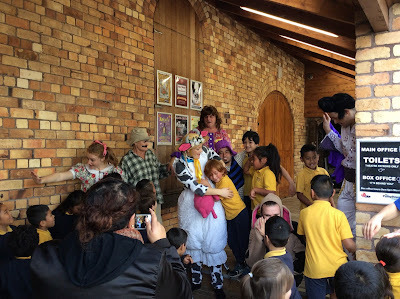 A junior student hugging Lucy the cow! 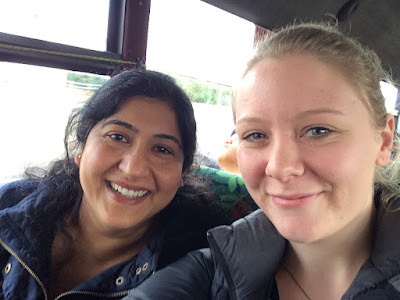 Archana and myself on the bus ride back. When we got back, we had lunch and then whole class assembly. As it was Maori language week, we learnt a poi dance/song and made headbands using Maori patterns. 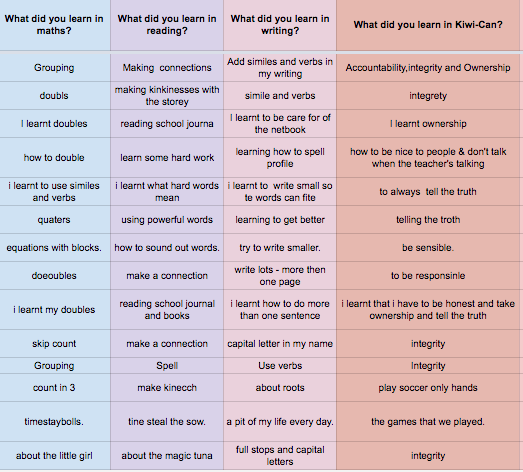 The same as last term, I sent my students a survey to find out their thoughts and feelings about their learning this term. It becomes obvious who really thought about the questions and who just wrote anything. You can read their responses here. For a quick overview, I have taken some screenshots. 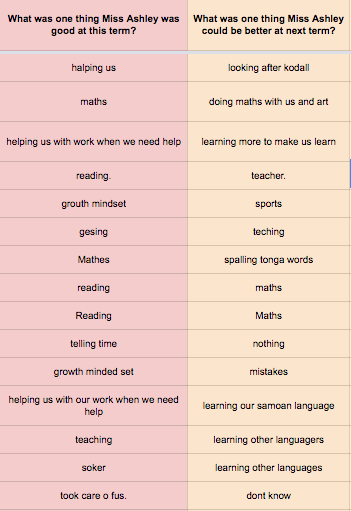 Things I was good at - soccer, growth mindsets, helping, reading with the students, helping them with maths and teaching them how to tell the time. 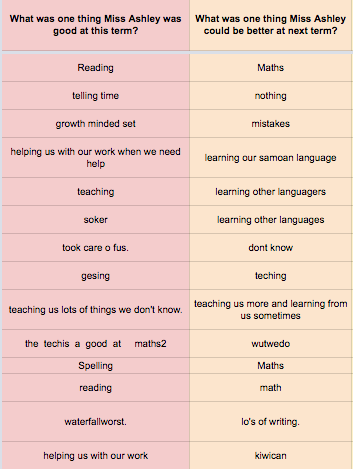 Things the students think I can better at - learning other languages (this has been a focus this term and I always say "I'm trying, I'm only learning!" when pronouncing other languages). Discussing with Archana, we think the students didn't really understand what this question was asking them, but that's alright. 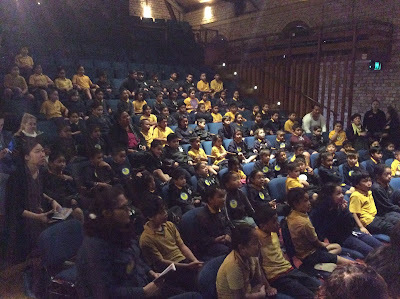 It was awesome to see most of the students thinking hard about what they have learnt throughout the term. 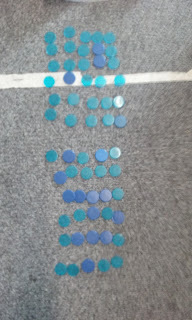 Lots of students learnt doubles, how to group numbers (i.e. 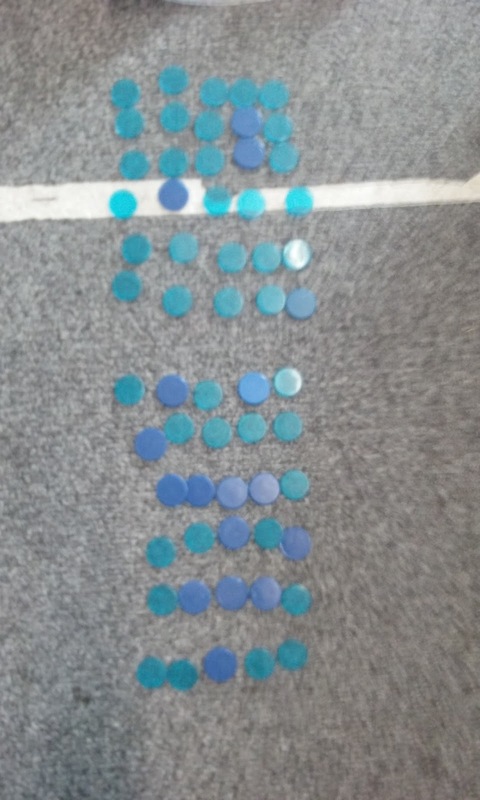 2 lots of 3 is 6, which is early multiplicative thinking), what a half and quarter is, equations with blocks (using physical materials to help him solve problems), skip counting and times tables. Yay! We have had a real focus this term on making connections between the text and their own lives, using powerful words to describe characters/settings in details, and sounding out unknown words and learning their meaning. Kiwi-can is an outside provider who comes into the school and teaches students values and some life-skills. A lot of my students remembered learning about integrity, taking ownership of their own actions and being held accountable for their own learning and actions. I also put in a couple questions to get their thoughts about what they want to learn about next term. We did a two week unit on plants this term, and myself and Archana want to do the same again next term. 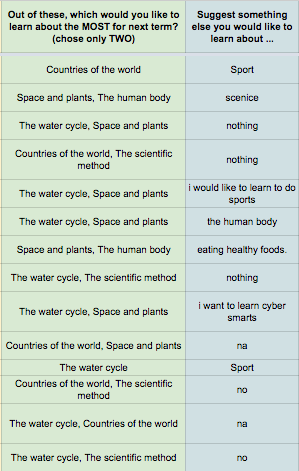 I asked the students to vote out of a given list which things they wanted to learn about (green column) and then if they had anything else they wanted to learn about (blue column). My students are getting better and better at thinking about their own learning, and they enjoy having their voice heard and being asked what they want to learn - having some of the control back. Definitely some food for thought in here! This morning Sue Pine came in for Archana' observation/co-teaching session. As I her co-teacher and always in the class, I was just helping out with the lesson whilst Archana ran it and was discussing everything with Sue. Our students are very used to solving open-ended maths problems by now, as we have been doing them for most of this term. -then ask students "is there anything you don't understand?" 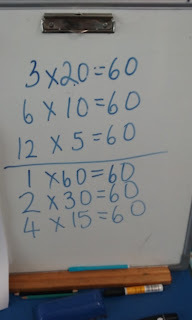 The students spent 30 minutes working out different answers in their mixed-ability groups of three. We came back together and the students gave their different answers (in the middle of this photo). Archana wrote on the board the way the first student said their answers '10 kids in 6 cars'. Sue quickly pointed out that that would later translate to 10 kids in 6 groups, whereas the 'groups of' should come first, as 'groups of' leads into multiplication, and this will cause problems there.. 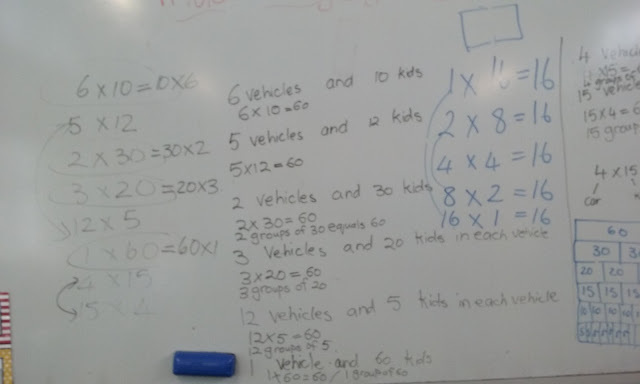 So this is something we as teachers should be careful of..
Archana and Sue talked the students through how to re-word their answers, from written ''6 vehicles and 10 kids in each', then changing it to 'groups of', for example "6 groups of 10 kids equals 60", finally to an equation '6x10=60'. Sue also spent five-ten minutes trying to get students to understand the difference between 5x12 and 12x5. The students are very new to the concept of reversibility, so only some of them understood the difference here. Sue then wrote these onto the teaching station (copied from the students answers on the whiteboard). She asked the students 'what do you notice'? An open-ended question, it encourages students to look for any possible thing they might see, and it lets them know there may be more than one answer as well. 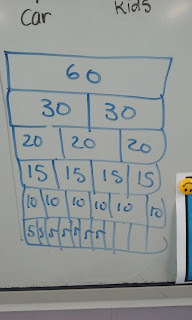 The students noticed that 6 was double of 3, and 12 was double of 6. Sue then took it further, and pointed out how as one doubled (3, 6, 12), the other 'factor' halved (20, 10, 5). Some students did not really understand this concept, however some did which was awesome. Sue then drew this diagram - another visual representation of the concept she had extracted from the students responses. As she was talking to Archana about how drawing it in a diagram might hook in other students who previously didn't get it (visual learning preferences), one student almost screamed I GET IT NOW! Afterwards, Sue and Archana discussed how some of the students approached the problem. 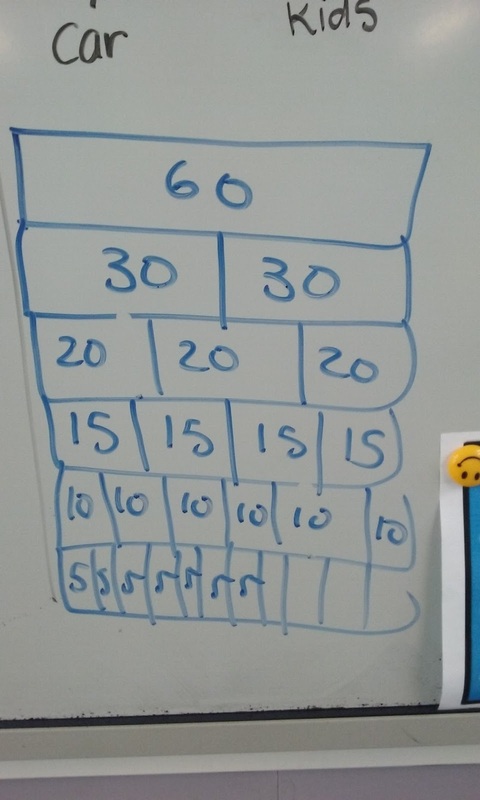 One pair of boys, who are below the National Standards tried to find factors of 60 using an array diagram (shown above). We were all quite impressed with these particular boys using this strategy, and highlighted it to the class to remind them there are lots of different ways to solve problems. I liked the way Sue used many different ways to try to explain the mathematical thinking at different levels/points in time, and how each way obviously worked for some learners and not others. Archana and I talked about making this a goal for ourselves in term 3 - trying to use a variety of ways (multiple visual, multiple oral) to explain the mathematical concept. I also found the questions Archana asked the students BEFORE they went and solved the problems very helpful. 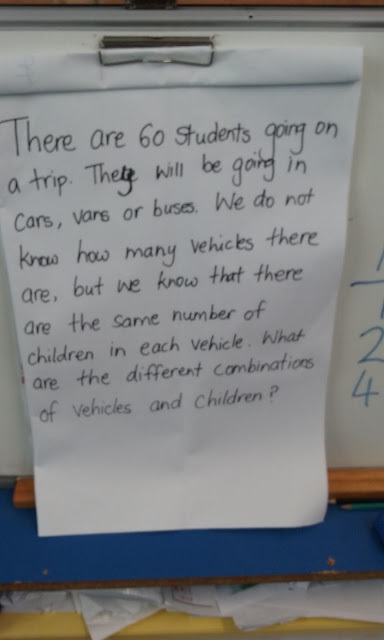 It took only a few minutes, but gave the opportunity for students to think, ask, answer, pull apart the question before they actually went away to try and solve it. I will be using these in my future practice. As it nears the end of term 2, it dawned on me that I have not shared anything with my colleagues, from the extensive Digital Immersion I get as an MDTA, that they do not get. I chose to start with Google Forms, as this is the least used Drive tool in my school, which got some exciting new updates this week. I plan to add to this little series, showing other ways to mark tests, and how to include videos/resources into a form (to then use it as a learning activity rather than a post-test). 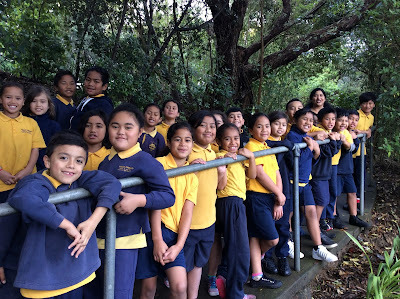 Today the MDTA's spent the morning visiting Manaiakalani schools, observing and seeing how other schools do things. 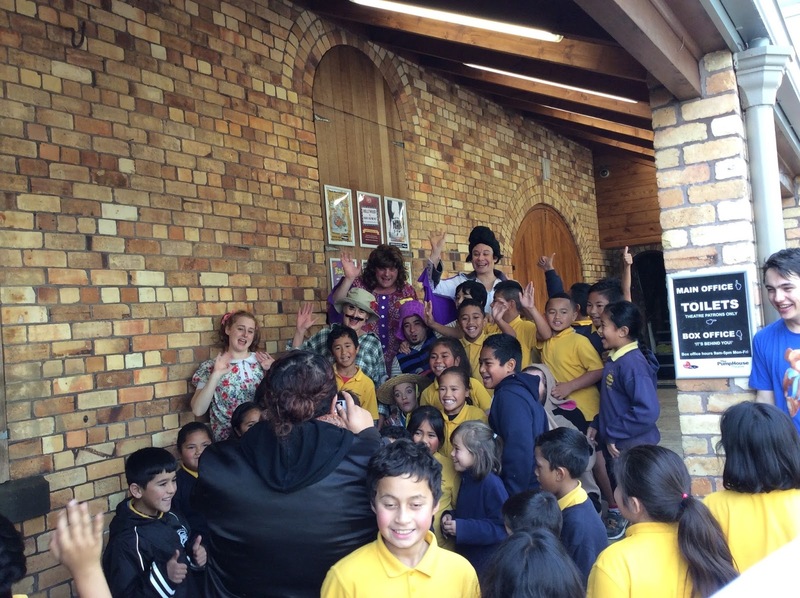 I visited Stonefields School and Point England School. I wanted to focus on the 'create' part of the learn create share pedagogy. 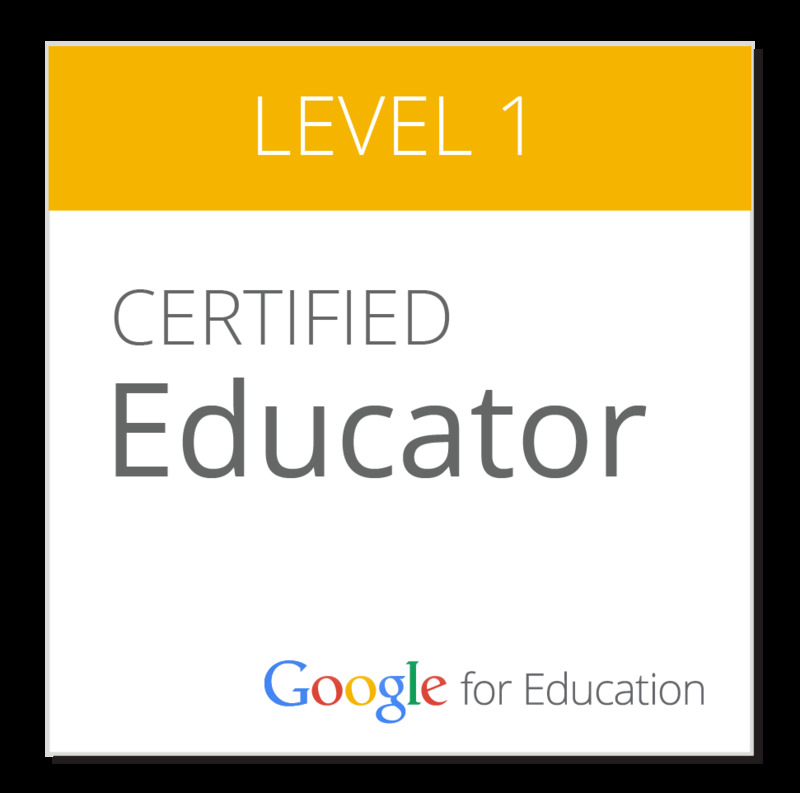 This is because I have gotten bored this term of giving students follow ups on their Google Drive - docs, slides etc. I have been feeling that students aren't getting the maximum they could out of their learning, as some of the things they are doing are very individualistic, very one person on one computer no talking allowed, and I want to change up my programme. At Stonefields, it was breakthrough time and so students were working in groups on a project of their own choice. It was awesome to see them working towards something real - one group was planning their fundraising, aiming to get enough money to buy a defibrillator for the school and community. Another group was designing beanies, gloves and scarves with the school logo on them because they identified that students came to school very cold in the mornings, but aren't allowed to wear non-uniform items. Another group was making a to-scale model of their field, with rugby posts, a cricket pitch and soccer goals on it. That was their proposal for the principal to purchase the posts/goals/build the cricket pitch on the school field which is currently bare. Each group was making a proposal for the school principal to buy/do/support their cause, so they could be empowered to make positive changes in their own community. It was awesome to see students working towards something real, where they could see real results. They had power in their own school environment, which is rare. They also got to chose what they wanted to do the project on, under the umbrella on 'giving back to the community'. At Point England School, I focused on how they use their Chromebook's for learning. The students gave me some of their favourite learning websites, maths games such as maths-whiz, pobble365, and other Chromebook extensions. Talking with the team leader, she discussed that the best way to have interesting 'creates' is to use a mixture of Macs, Chromebooks, Ipads and non-digital aspects. She kept saying "Chromebooks are boring" - which in this context, I agree with. Using them by themselves is boring - using different ways, a combination of different products (Macs/Ipads), each for a different purpose etc, that is interesting. I was really inspired by the level of choice at Stonefields, within breakthrough and in learning tasks. Students are often given the framework or structure, and given choice in how they approach it. For example, they could chose a book to read (at their reading level) and then use that book to answer generic questions, practice getting the main ideas, summarising etc. They also did things in a real context - making the community a better place, having a reading/writing focus about real topics such as should zoos exist? They had power. Another thing I want to pursue more is getting and using Ipads for my lower learners, or maybe an suitable app or extension for their Chromebooks that would do the same thing. These particular students (almost a third of my class) can barely read, and do not understand what they can read. This limits them in accessing and using the class site, and using their Google Drives independently, literally because they can't read what they are clicking on. I want to try and source some Ipads to use with these students, in the same way the junior school uses them. My aim would be to improve their reading ability, and their ability to work independently and help each other in a group situations. It was very helpful and refreshing to visit other schools, get new ideas and get encouraged to open up my reading programme more as well.